Do you get a case of the jitters when it comes to asking for major gifts? We get it. It can be nerve-wracking! At 2018’s Bloomcon, Claire Axelrad provided some great tips for overcoming ask anxiety when it comes to major gifts. She broke them down into six categories: passion, prepare, practice, pitch, pay attention, and persist. You have to know your organization’s mission, your values, and how those things intersect before you can expect to make a convincing ask! Consider coming armed with a story from your organization that really struck a chord with you and made you realize how much of an impact donors can have. Sharing a story that shows the good that can be achieved with a donation AND that showcases your intense passion about your mission is a double whammy! 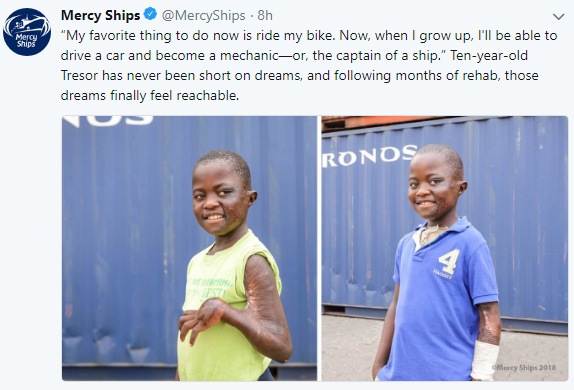 This great example from Mercy Ships popped up in our Twitter feed recently. A little boy whose life was changed by the organization imagining the possibilities available to him (including maybe becoming the captain of a ship like the one operated by Mercy Ships) is an absolutely charming story that really tugged on our heartstrings! Remember that how you say something is more important than what you say, too! Sure, you can tell a donor that $10,000 will provide life-altering surgery for children, or you can tell them a story about how every $100 provides $200-worth of surgery for a child like Tresor, show them pictures, and provide video or quotes. Want to prove your passion? Make a donation of your own! The old adage that actions speak louder than words has been around for ages because it’s true. People are more likely to give when they see that you have given. You can tie it in with your storytelling, as well. “I set up a recurring donation after reading Tresor’s story…” shows that you are passionate about and committed to making a difference. Don’t walk in and expect magic to happen without putting in any effort! You need to be ready for any questions your prospect may have. Ensure you’re well-versed in what your organization’s programs accomplish, particularly those that fit your prospect’s interests. Work for an animal shelter and have a prospect who is passionate about providing services to pet owners in low-income or remote areas? Come prepared with information about your mobile vaccination unit, including how many people/animals are served yearly and the value provided to the community. Pictures and stories from those who have benefited always go over well, too! When making contact, make sure you tell the prospect why you’re contacting them. Frame it as a visit, not an appointment, and make sure you’re appealing to their philanthropic interests. Make it about THEIR interests, not YOUR needs. Claire emphasizes that once you’ve got the visit, you’re 85% of the way there! A prospect wouldn’t agree to meet with you if they weren’t already interested in giving. Go in with a specific ask amount in mind and a set purpose. Don’t waffle around and give the impression that you’re not really sure why you’re there. A bit of donor-centered chat and information gathering is great, but be sure you’re considerate of the prospect’s time, as well. Ever notice that when people stutter or say “um” a lot while they’re speaking that it distracts from their main message? Yeah… you don’t want to do that while talking to a prospect! You want to sound confident and knowledgeable, not nervous and unsure. Make sure you’ve run through your story and ask with someone before going for a visit. Don’t worry, it won’t make you sound too rehearsed… it will just allow your passion and message to come across more effectively! Being specific with your ask takes pressure off of your donor. Don’t make them do the work for you. Make the amount you’re asking for, the purpose, motivator, and urgency clear for your prospect. Don’t leave them sitting there wondering how much they should give, why they should give, or to which program they should give. Claire says that silence is golden. After you make your ask… be quiet! Let your prospect respond and tell you what they’re really thinking. It will be tempting to keep going after you make the ask, but don’t jump the gun! You’ve told your story and made a specific ask, now it’s up to the prospect to respond. Trying to have a conversation with someone who is obviously not listening or who keeps interrupting you with their own agenda is one of the most frustrating things that can happen. Don’t do that to your prospect. You have two ears and one mouth… so listen more than you talk. Claire points out that this visit is not an aggressive sales pitch. Listen to your prospect, learn what they care about, and figure out how you can help them meet their philanthropic desires. The more you learn, the more you can assist! Remember not to take anything personally. Try to gently overcome any resistance by framing everything on your donor’s terms… it’s so important to appeal to their interests. Even if your visit ends with a no, close it on a happy note. Remember, no solicitation is wasted if you keep the relationship going!